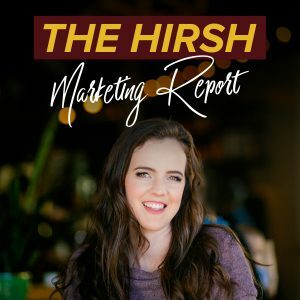 In this episode, I explain what The Hirsh Team does differently than any other ads agency or third party software out there: manual, daily tracking for your Facebook Ads! Join me as I go behind-the-scenes to explain the 6 things you should be tracking every day and why you shouldn’t just look at Facebook’s ads manager (or blindly trust a third party software). Trust me when I say, it’s not really that complicated – but this kind of tracking can make or break your ROI and is vital to your ads success. In today’s episode of the podcast, I’m going to go behind-the-scenes and share with you guys what we track every day for our clients. And if you’re running your own ads or somebody’s running your ads, this is what they should be tracking for you. So our process in our team is that every single client has a spreadsheet, and every Ads Manager fills out that spreadsheet manually every day. And before I dive in, kind of funny side story is: I’ve had people join my team who have been like, ” This is so labor intensive,” or like, “Do we really have to do this and fill it out manually?” Most of the time they didn’t work out. That was like in the first two weeks, they’d try to cheat the system; but I have yet to find a software that really accurately reports the way I want to report for our clients and what I feel like we need to do for our clients that is accurate and easy and simple to use. But also, the other piece is that the Facebook Pixel can either over- or under-report for up to, like, 25 to 30 percent off – so I really think it’s important that you go in and you look at that. And if you’re like, “Wow, Facebook is saying I got a hundred leads today, and I don’t think that’s right. I only see, like, 50 in my CRM” (or something), you’re able to flag that, and that’s also what a third party software can’t do. So hint, hint, side note: Maybe in the next year Team Hirsh will be actually creating their own software for this! We have built the foundation in Google Docs and Google Drive. But today I’m going to give you guys the behind-the-scenes. I actually have pulled up in front of me one of our Ads Manager’s daily tracking for a client, and I’m going to share with you what they fill out every single day. And so what that means is we basically take the summary of that [daily report], and we send our clients a weekly report (because they don’t normally need to see the daily one). Somebody who’s hiring out their ads, they actually don’t want an update every day on their ads unless there’s a problem. But they definitely should be getting a weekly report. So we send our clients weekly reports, but as a team fill out a daily report for every client. So, a lot of our clients are running traffic to webinars, and that is what I have pulled up in front of me, because that is … You know, 85% of our clients are driving traffic to a webinar, if not more. So what the Ads Manager fills out is.. They have a tab for the client, and they fill out on this the number of leads that we got that day, the number of sales that we got from the funnel that day. So again, a third party software can’t do that, because it doesn’t mean that that sale is going to be reported in Facebook. We use either UTM codes, or sometimes in some cases a completely separate funnel that’s only being used for Facebook ads, to know exactly what sales are coming in from Facebook-only leads. And so that’s really important. I highly suggest doing that, because then you can also see in three months from now how much ROI your Facebook ads have gotten you. The more data, the more you can separate out your Facebook leads compared to any organic or other leads and sales, the better. So number of leads, number of sales, average cost per lead, total ad spend, what changes the Ads Manager made today, and what’s coming up. Pretty simple, right? It’s not actually super labor intensive. So they report that every day for most of our funnels. … I’m trying to think. If it’s eCommerce, we just report sales and cost per sale, but most of the time, we’re looking at leads, sales in the funnel, average cost per lead, ad spend. Okay? I want you guys to see here one thing, and that is we don’t just look in Ads Manager. So the Ads Manager on my team will also login to, let’s say it’s ClickFunnels, and look and see if the client got sales – and that’s really important. That’s again what a third party software doesn’t do. So with all this data, at the very top of the spreadsheet, we have the following things … It adds up the formulas and gives a summary, and that [includes the] client’s monthly lead goal and then the amount achieved and the percentage of goal. So the one I’m looking at here is actually for all of August. The client monthly lead goal says 5,000. We achieved 5,201 of those leads, so we’re at 104% of our goal. But that means every single day we can go in and see: Are we on track for our lead goal for the month and at our percentage of goal? This is created so it’s calculated for us, and you should be able to see that. You need to know: How many leads do I need to get in every day and how many, like how close am I to my goal? What’s your goal? [Remember] Phase One of The Hirsh Process is to Strategize. You should know [your goal] before you start ads. The next thing it says is client monthly sales goal 50, achieved 49 (so we’re at 99% of our goal for the month of sales), client monthly budget (how much we spent), and then we have lowest cost per lead to date, highest cost per lead to date, and average cost per lead. The reason I have the lowest, highest, and average is because we send out the Hirsh Marketing Report – so all this data from every single client goes to a master spreadsheet for me where I can see everyone’s lowest, highest, and average cost per lead for the month. And then I can report that to you guys. Then the Ads Managers will sometimes put in some of their own notes. For example in this one, it has the funnel map that this client is going to [and] how much her course costs so that they can calculate the ROI each week. But it’s not that complicated. We ultimately need to know: How many leads are we supposed to get, how many leads have we gotten, how many sales do we need to get, how many sales have we gotten, and what’s our ad spend budget for the month? Like, that’s essentially it. 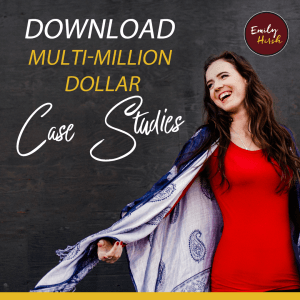 And then, the reason we put in what changes I made and what’s coming up is because we can then look back and go, “Okay, let’s look back two weeks and see… Wow, okay, on this day we had $1.71 average cost per lead!” And I see it right here: 8/21, $1.71 webinar cost per lead. The note says, “Amazing, scaling the ad sets.” Okay, and so then we can look even in more detail and try and see what ads sets are converting and what was different about that day. So that’s what we report on every day for our clients, every single client, and that ultimately creates our weekly reports. I want you guys to see a few things. One, it’s not complicated, because if it’s too complicated, people can’t pay attention to it and they also won’t do it. And it doesn’t have to be complicated! Break it down into very simple leads, sales, average cost per lead, ad spend, and then you just need to document what changes and what’s coming up. The reason we have what’s coming up is [so that] just in case an Ads Manager is sick, we can write “new webinar link coming on Tuesday from the client” [or something]. And … somebody else can come in and see, okay, we need to look out for that link. So that’s why we have it internally. And then having that … Making sure you have your goals set. Do you see here how my Ads Managers can’t do their work until we have Phase One – Strategize, of The Hirsh Process, done – which is setting the client monthly lead and sales and budget goals? Those are all tied together, because obviously we start with sales and then we say, “Okay, to get that many sales…” Like you can see, client monthly sales goal is 50. To do that, we need 5,000 leads. Her webinar converts at 1% of total leads. So we did the math very intentionally, and then the Ads Manager, after I do the strategy with the client, plugs that in and that’s what we track every single day. The other thing our spreadsheet does, and that you can build if you want (or have [your ads agency] just put this so you know), is if somebody is way below their percentage of goal, in our master sheet it will highlight them in red. We’ve been able to automate that in Google Docs, because it will highlight that client in red saying they need attention, they’re below their percentage of goal. Here’s our problem clients. And that gives me a list of boom, boom, boom. Here’s where my attention should go. Here’s where my Manager’s attention should go. But if you had multiple funnels, you could do that, too. You could have a tab for each funnel or whatever, and then be able to see. … For every client we do that. If a client has multiple funnels, we have the same thing: lead, sales, budget set for every single funnel. And we do not turn on ads until we have that. Then we track against it every day. If you do this, it’s really hard for anything to slip through the cracks. It’s really hard for you to not know if it’s working or not. And so, a lot of these notes in here from my Ads Managers for this client account are about scaling, scaling, scaling, because she’s getting sales, it’s converting great, and it’s under her threshold. We’re just trying to scale, so you can see the ad spend increase every day. The Ads Manager is going from 350 a day, to 384 a day, to 400 a day – and it’s going up and up and up. So that is what we look at every day in the backend for our clients. And if you want access to that Hirsh Marketing Report that I mentioned, which basically takes all this data and then reports on those lowest and highest cost per leads and tells you how much ad spend we managed as a whole, how much profit we made – all those things … You can go to hirshmarketingreport.com and subscribe to that. We send it out at the beginning of every month, reporting on the previous month.